Research the company: Do your research online and investigate the internal dress code (the company website and social media channels often offer clues). Tailor your style to the company's image so as not to alienate those interviewing. Stay in your comfort zone: Now is not the time to try the latest trends or to make a bold fashion statement. Wear something comfortable yet smart that makes you feel good. Wear comfortable shoes: I made the mistake of wearing new loafers that I hadn't broken in to an interview last year. Just walking into the interview was uncomfortable and I felt self conscious rather than confident thanks to my unavoidable my-heels-are-in-agony limp (unsurprisingly I wasn't hired). A mid-height heel is good solution, walkable meets confidence-boosting is a winning formula. Watch your hemline: A raised hemline will raise eyebrows. Keep things knee length or below, you'll be thankful when you sit down in front of HR and your hemline rises! Wear something memorable: This slightly contradicts my other tips, however, I strongly believe that an eye-catching accessory can set you apart in a sea of candidates. One former boss told me she hired me because she liked my mint green nail polish (!) - this tip applies even if you don't work in a creative environment - a colourful tote or an eye-catching drop earring can help to differentiate from the crowd. Corporate: Le Marais navy tuxedo jacket, The Fold London, £245. Le Marais navy tapered trousers, The Fold London, £155. Navy heeled courts, Dorothy Perkins, £25. Structured work tote, Charles & Keith, £59. Creative: Silk stripe blouse, Uniqlo, £39.90. J.W.Anderson navy pleather skirt, Avenue 32, £148. Sophie Hulme textured shoulder bag, The Outnet, £294.25. Navy honeycup ankle boots, Rupert Sanderson, £555. Career move: Iris & Ink silk shirt dress, The Outnet, £160. Skinny bud drop earrings, Monica Vinader, £110. Maribel red courts, Liam Fahy, £390. Mini Devonshire tote, Loxley England, £425. The Edeline Lee girl for AW14 was a sneaker-sporting, cobalt-clad, urban girl. In contrast, SS15 saw a romantic, feminine turn for the London-based Korean Canadian designer, who presented a collection inspired by the renovation of her Victorian home in East London. A sense of theatre defines Lee's LFW presentations, and this season's set up - a custom built marquee on the Somerset House terrace - was particularly impressive. Inside the space, models were posed inside individual 'rooms', each themed by a colour card from the Little Greene collection and decorated with colour co-ordinated curios from fine china teapots to ceramic pineapples and romantic canopies of powder-pink roses. 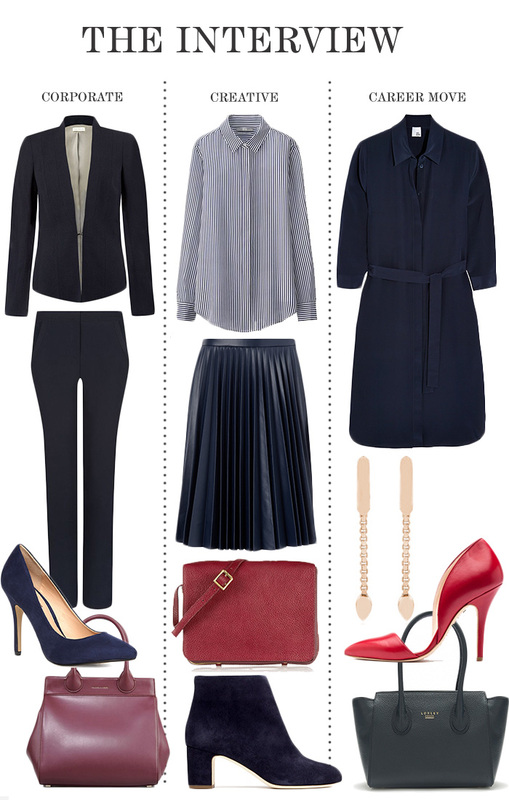 Top Row L-R: Iris & Ink navy silk shirtdress, The Outnet, £160. 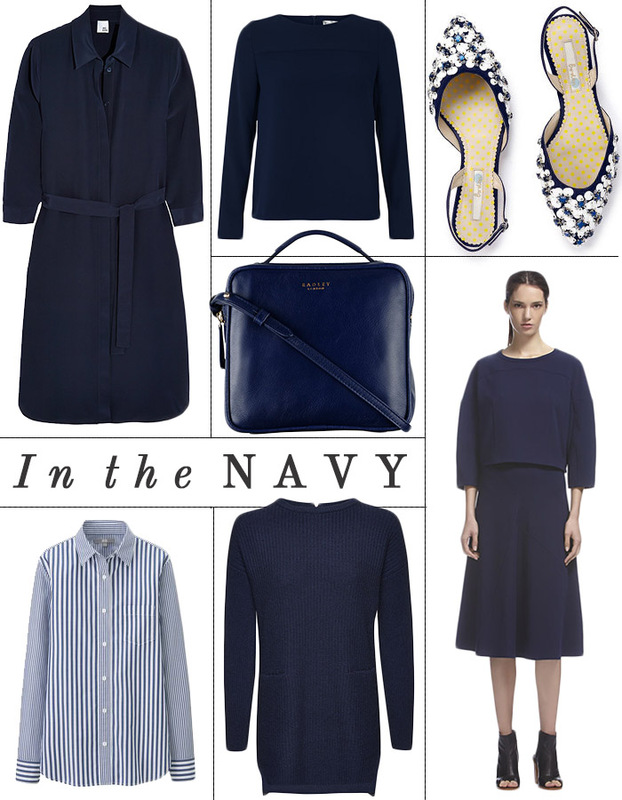 Le Marais boxy top in navy, The Fold, £125. Bella slingbacks in navy, Boden, £99. Middle Row: Radley Victoria Park leather cross body bag, John Lewis, £159. Bottom Row L-R: Extra fine cotton stripe shirt, Uniqlo, £19.90. Cashmere-mix ribbed tunic, Whistles, £195. Lola crop top and Maddy skirt, Whistles, £95 & £45.